The returning forces – 122nd Engineering Battalion based in the Edgefield Armory – were the true stars of the morning event. This was a breakfast for all the Battalion returning from their deployment in Afghanistan, held at Strom Thurmond High School, on a beautiful Sunday morning. However, not taking from the worthy work and certain losses (a number of Purple Hearts were given Battalion members for injuries suffered there) – the real story was the huge display of food and underpinning of money and time contributed that came about with one week’s notice. After breakfast, which actually started an hour early at 8:30 (it was ready as the troops arrived), not 9:30 as advertised, the table still held a bounty of delicacies. 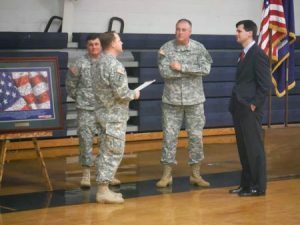 At 10:00, the troops were called into the gym for an “Uncasing of the Colors and Freedom Salute Ceremony.” Stirring speeches, the National Anthem, Presentation of Colors, and the playing of the Army Song, all honoring these men and women who spent a year away from their families and jobs. These troopers were a part of Operation Enduring Freedom and provided theater combat engineer support including training and mentoring Afghan National Army (ANA) engineer force, construction and deconstruction projects and theater route clearance operations to combat the improvised Explosive Device (ED) threat. All these activities were to help secure stability, peace and prosperity for the people of Afghanistan.